To delete a file or folder, select it and click the Delete button in the upper panel or from the context menu. If there is no Delete button on the upper panel, click → Delete. Files deleted from the Disk are kept in the Trash for 30 days. They are then automatically removed from the server. Once removed from the server, these files cannot be restored. 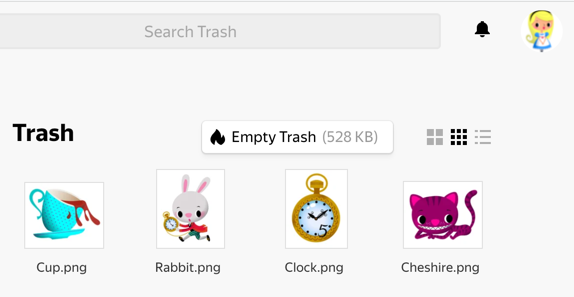 Click the Empty Trash button. Choose the files or folders. On the top panel, click the Restore button.